Citation Information: J Clin Invest. 2007;117(12):3765-3773. https://doi.org/10.1172/JCI32538. S-phase kinase-associated protein 2 (SKP2) is a component of the E3 ubiquitin ligase SKP1-Cul1-Fbox complex. Overexpression of SKP2 results in cell cycle dysregulation and carcinogenesis; however, the genetic lesions that cause this upregulation are poorly understood. We recently demonstrated that forkhead box P3 (FOXP3) is an X-linked breast cancer suppressor and an important repressor of the oncogene ERBB2/HER2. Since FOXP3 suppresses tumor growth regardless of whether the tumors overexpress ERBB2/HER2, additional FOXP3 targets may be involved in its tumor suppressor activity. 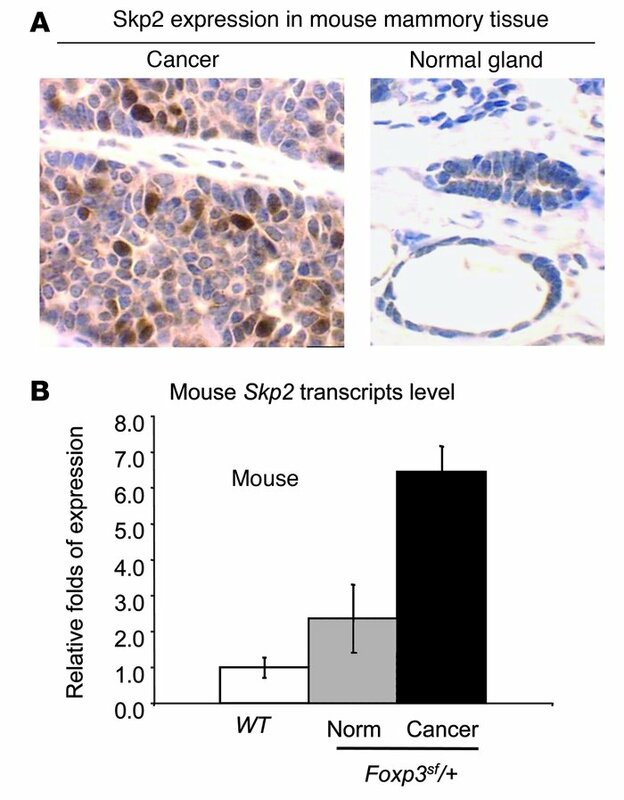 Here, we show that mammary carcinomas from mice heterozygous for a Foxp3 mutation exhibited increased Skp2 expression. Ectopic expression of FOXP3 in mouse mammary cancer cells repressed SKP2 expression with a corresponding increase in p27 and polyploidy. Conversely, siRNA silencing of the FOXP3 gene in human mammary epithelial cells increased SKP2 expression. We also show that Foxp3 directly interacted with and repressed the Skp2 promoter. Moreover, the analysis of over 200 primary breast cancer samples revealed an inverse correlation between FOXP3 and SKP2 levels. Finally, we demonstrated that downregulation of SKP2 was critical for FOXP3-mediated growth inhibition in breast cancer cells that do not overexpress ERBB2/HER2. Our data provide genetic, biochemical, and functional evidence that FOXP3 is a novel transcriptional repressor for the oncogene SKP2. A naturally occurring mutation in the Foxp3 locus results in increased Skp2 expression. (A) Immunohistochemical staining of the Skp2 protein in mammary cancers and an adjacent normal mammary gland in 1 Foxp3sf/+ mouse. Original magnification, ×40. (B) Relative levels of Skp2 transcripts in normal mammary epithelium of WT and Foxp3sf/+ mice and the cancerous tissue in the Foxp3sf/+ mice, as revealed by real-time RT-PCR of LCM samples. The expression of Skp2 was normalized against the internal control, the Hprt gene. Data shown are means ± SD of 3 samples in each group. Highly significant differences were observed between cancerous and normal tissue (P < 0.001, ANOVA test when either internal standards were used).